Surf your city, with all its curbs, bumps, stairs, and jagged edges. This maple wood, eight-wheel longboard has twice the number of wheels as a regular one. Together with built-in shock absorbers in the chassis, the design makes your ride as smooth as possible. The wheels move independently, conforming to the shape of the surface you’re riding over. Dimensions: 31.5" x 9.80" x 4.70"
Surf through city landscapes. 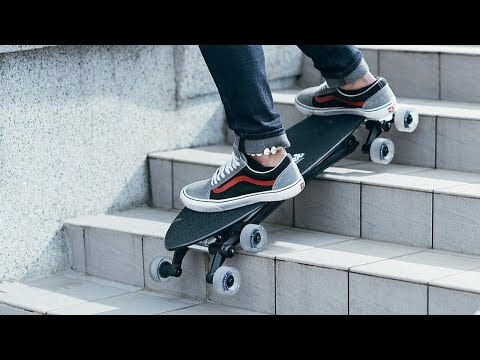 This eight-wheel longboard glides right over bumps, curbs, and even stairs. A group of London-based designers, engineers, and avid skaters set out to build a longboard designed to navigate—or should we say “shred”—urban terrain. With twice the number of wheels as the regular ones and built-in shock absorbers in the chassis, AllRover conforms to the shape of the surface you’re riding over. The wheels move independently and adapt for a softer, less jolty journey. And when you’re not riding, its maple wood and aluminum body is lightweight and easy to carry. The designers embedded a handle cutout into its design to give you a better grip. Whether you want to dominate stairs and sidewalks, or you just want a sweet board to traverse the city, this rugged ride does all of the above.